When you listen to Philip Yeo talk about how he got things done in the early years of Singapore’s development, you wonder if he is talking about a different place. 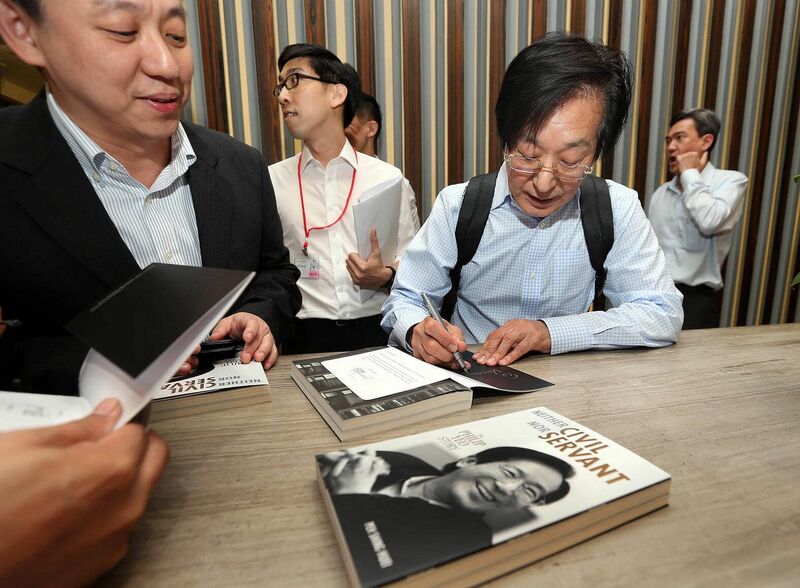 I had been hearing him quite a bit the last year, sitting in in all the 10 interviews that author Peh Shing Huei had with the man for the book, Neither Civil Nor Servant: The Philip Yeo Story, which has just been launched. Of course, Mr Yeo is not the typical civil servant. For one thing, he hates to be called one, because he hates writing papers (preferring to just do it), meetings (he can make a decision without having one), and he hates bean counters who block him from charging ahead with his projects. As I listened to him, it was clear what I was hearing wasn’t just his story but part of the larger Singapore story. When people talk about how the country has made such rapid progress over the years, the founding political leaders take centre stage – Lee Kuan Yew, Goh Keng Swee, S. Rajaratnam and their other Cabinet colleagues. Underpinning his swashbuckling style were the same qualities he shared with his pioneer generation colleagues: a can-do spirit, a strong conviction that Singapore could succeed, and courage to do what they believed was right. They had the vision, political courage and total commitment to make Singapore succeed against the odds. But you also need capable people to implement those nation- building projects – building an army, housing a people, industrialising the country and developing its infrastructure. The work fell largely on a group of trusted civil servants who worked closely with their political masters, often with inadequate resources but always with courage and conviction – men like Howe Yoon Chong, Sim Kee Boon, George Bogaars and Joe Pillay. Mr Yeo started at least 10 years later but he was so quick off the block, he made his mark as well in many of those early endeavours. What was it about this group that enabled them to do so much, how did they do it, and why are they so different from today’s mandarins? The answers are not just of historical interest but might help Singaporeans understand how the country got here and what it takes to bring it to the next level of development in these challenging times. First, you have to understand how differently civil servants like Mr Yeo operated. How differently? Here are two of my favourite stories. When he was made branch head of the Logistics Division in the Ministry of Defence in 1970 at the age of 24, tasked to equip, clothe and feed the fledgling army, it was mission impossible because he had all of four staff. But he didn’t let that deter him or complain to his superiors or write a memo asking for more manpower. Instead he pored through computer printouts of all the enlisted men looking for those with university degrees, preferably in engineering, and “who couldn’t march straight”. He was looking for misfits whom he knew the army didn’t know what to do with, making them clerks and storemen despite their educational qualifications. That was how he was able to get 250 enlisted graduates – his systems engineers as he called them – to work directly for him, and so Philip Yeo’s own army was formed, one of several he would subsequently gather to do the many projects he undertook for Singapore. “Good idea. What are you going to do?” asked Dr Goh. “I want to start work now,” Yeo replied. It might have been the first time in Singapore that a minister wrote a paper for a civil servant but Dr Goh was happy to oblige because he knew Mr Yeo could deliver; he just couldn’t write. It is tempting to dismiss these stories as the quirks of a known maverick who went against the grain. But underpinning his swashbuckling style were the same qualities he shared with his pioneer generation colleagues: a can-do spirit, a strong conviction that Singapore could succeed, and courage to do what they believed was right. I was fortunate to have started my civil service career under Mr Sim, another master at getting things done but in a quieter and less abrasive way. He always made you feel that you could solve any problem if you put your mind to it and he was adept at getting people to work together even if they came from different organisations. Others like Mr Pillay, whom I interviewed earlier this year at a forum which I moderated, couldn’t be more different in temperament from Mr Yeo, but the commitment and drive to make Singapore succeed were as strong. They also shared several common experiences which I believe shaped their thinking and contributed to their success. First, they were given big jobs at a young age, usually in their 20s. By the time they were in their early 30s, all had made permanent secretaries – the highest rank in the service. When you are young and fearless, perhaps even reckless, and are not afraid to take risks and go against the conventional wisdom, you learn fast from your failures and successes. When bureaucracies mature, they become more risk-averse, preferring not to rock the boat. Second, these young pioneering officers worked closely with the Old Guard leadership, mainly then PM Lee and Dr Goh. Their political masters were tough and demanding but when their confidence in these men grew, they were given room to grow. In the book, Mr Yeo spoke affectionately about his mentor, Dr Goh, and how he was given plenty of leeway to operate as long as he delivered what his boss wanted. Over time, as the relationship grew, these civil servants repaid the confidence their political masters had in them with even higher levels of performance and responsibilities. As Mr Yeo recounted, Dr Goh’s preferred method of rewarding high performance was to give the officer even more work. Third, while permanent secretaries are known to be generalists able to take on any job, the pioneer civil servants tended to stay on in a particular area, building up their expertise and experience. Mr Yeo worked in Mindef for 15 years, and on economic and technology issues in EDB and A*Star for 11 years. Mr Pillay is best known for his work in economics and financial matters, serving in the Finance Ministry and the Monetary Authority of Singapore for more than 20 years. There is a lesson here for the civil service today when officers tend to be rotated after much shorter stints.You have to wonder if this makes sense when problems are more complex today, demanding specialised knowledge and experience. In recounting these stories, I am not saying that civil servants were better in the past. It was a different time with a very different set of problems. But I think it is useful especially for younger Singaporeans to know how an older generation made the grade. They were civil servants but they didn’t allow the bureaucracy to get in their way.